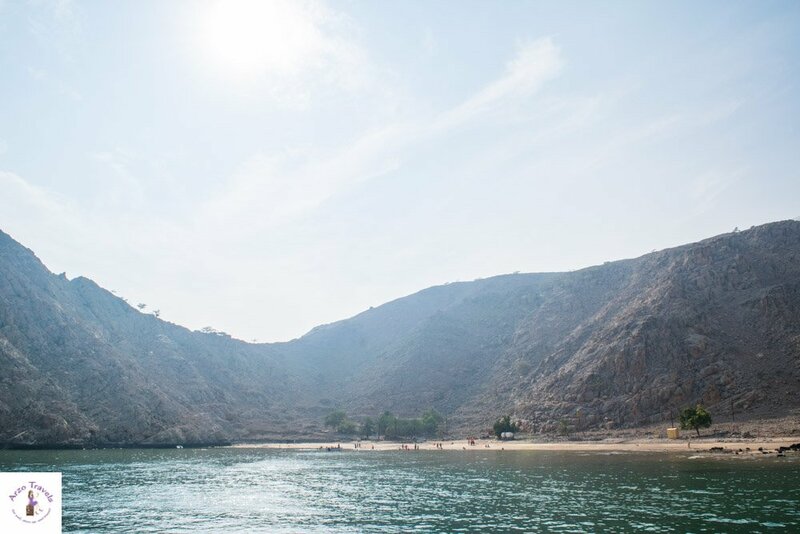 1.1 Why Visit the Musandam Peninsula? 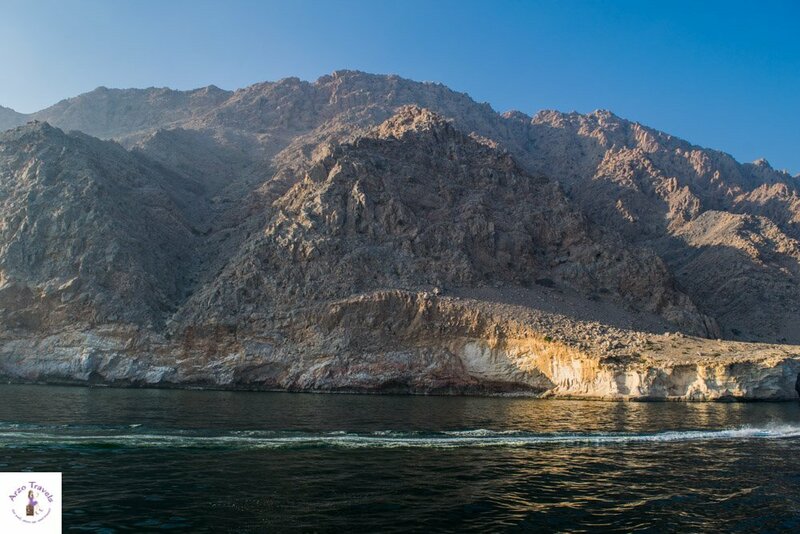 If you have a little extra time on your hands and are wondering where to go for a day from Dubai, then a day trip to Musandam, Oman should be on your bucket list and a Musandam Tour from Dubai is quite easy to do – so it is the perfect getaway for a day! It took me four visits to Dubai before I finally reserved a full day to see Oman and even just get a little glimpse of the northern part of Oman but it honestly is one of the top day trips from Dubai (that is why I added it on my “50 top things to do in Dubai” list). 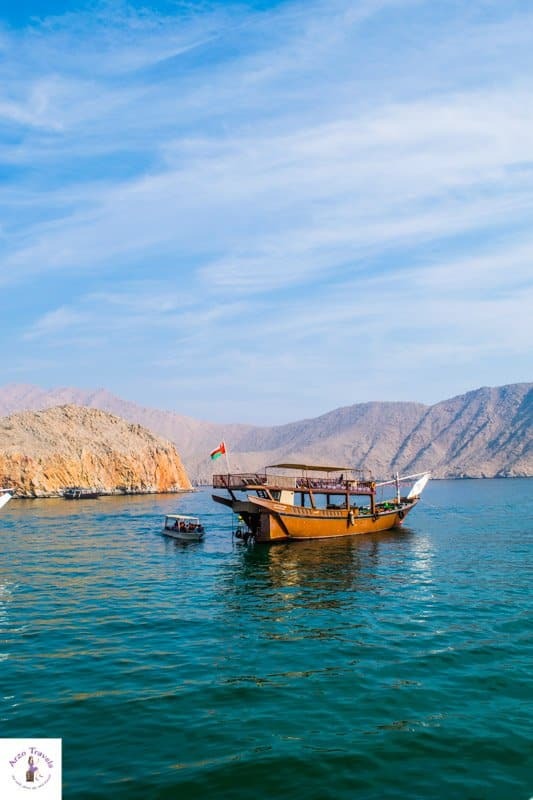 In this blog post, you will find out why you should take a Dubai one day tour of Musandam, how to get to Musandam, what to know before you go and what to do in Musandam once you are there. The Musandam Peninsula is located in the northern part of Oman about 200 kilometers from Dubai. 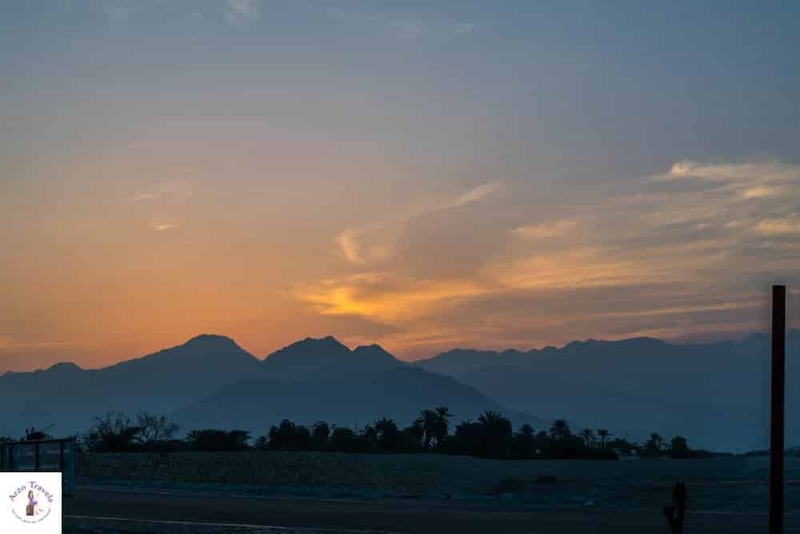 On your way, you will also cross Ras Al-Khaimah which is also a perfect base for taking a day trip to Oman. There are different Musandam tour packages from Dubai and it really depends on what you are interested to see and how much you like to spend. I will add a few different tours later for you. 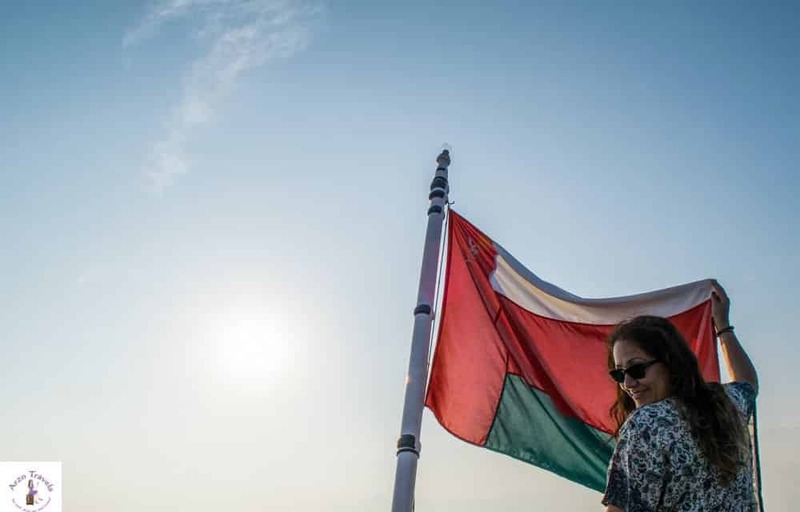 The Musandam Peninsula is a beautiful place in Oman – very authentic and full of history, especially when compared to the hustle, bustle and general glitziness of Dubai. 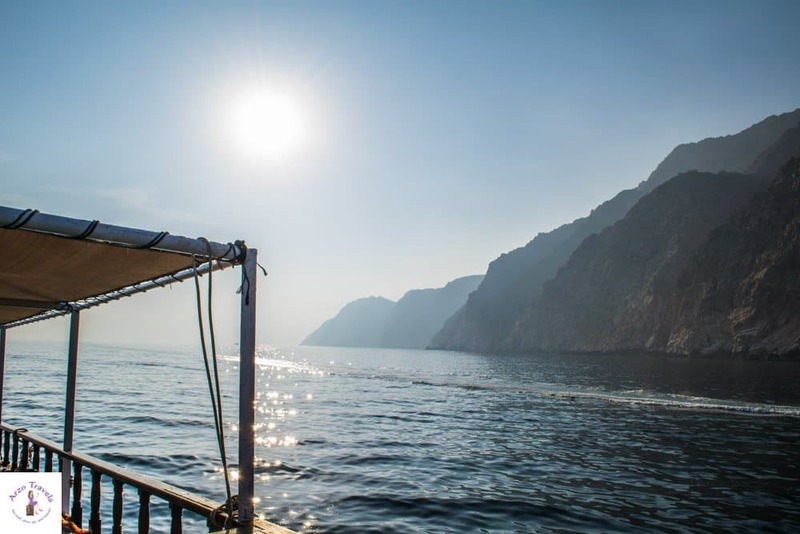 You should know before your day trip from Dubai to Musandam that driving takes a while but you will be rewarded with boat trips, lovely scenery and incredible views of the stark limestone mountains. 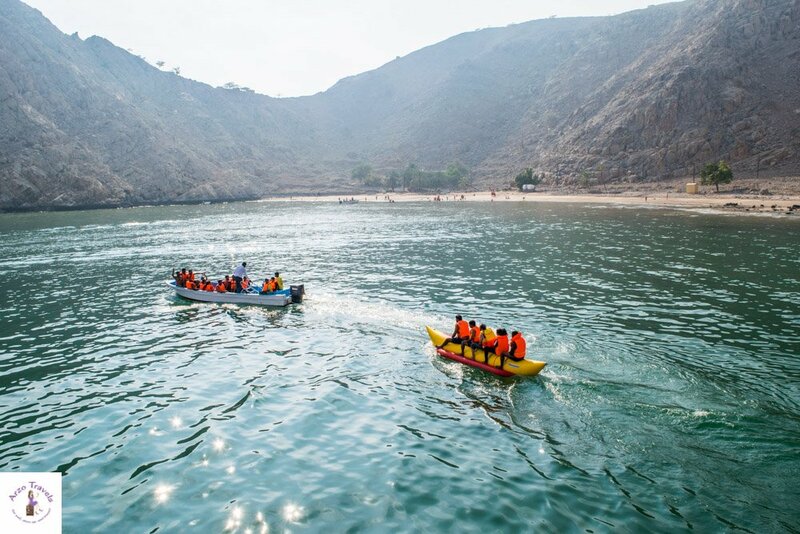 However, although Musandam is getting more popular these days and attracts a lot of tourists from Ras Al-Khaimah and Dubai it still retains its originality and natural feeling despite having a touristy touch to it. For a change of scene, it’s one of the best day trips from Dubai. To start your Musandam tour from Dubai you can either travel by car to Khasab which is about a three-hour drive from Dubai or if you do a guided tour like I did, then you will be picked up from the hotel. 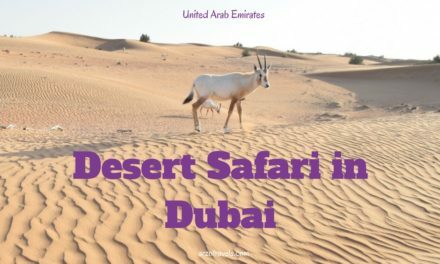 A guided tour to Oman from Dubai is probably the easiest way but of course, you could always fly from Dubai to Khasab if you prefer, but I actually recommend getting there by bus. 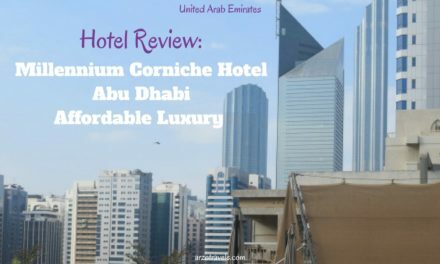 You can stay there overnight as well: I personally think a day trip is enough but if you can decide to stay longer you can click here to find the best rates for your accommodation in Oman. We were picked up from our hotel by the tour company and after picking up some other people we drove for about three hours to get to the border of Oman. From there it took about an hour to get through border security to where our dhow waited for us in Khasab, a village just beyond the border. If you have a visa for the UAE you shouldn’t need an extra visa for Oman but you definitely have to bring your original passport with you and to take a copy of your passport. It wasn’t needed for us but it was recommended by our tour guide. 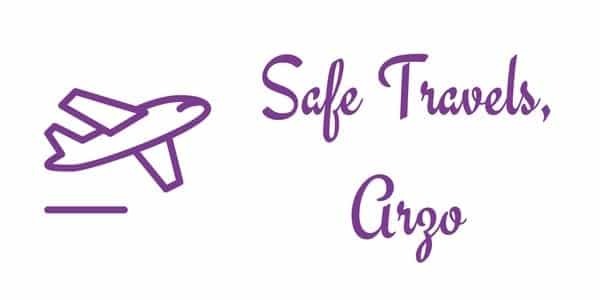 In order to make the most of your Oman trip from Dubai, it’s also important to take everything you’ll need with you: swimming gear, sun lotion etc. and of course your camera. 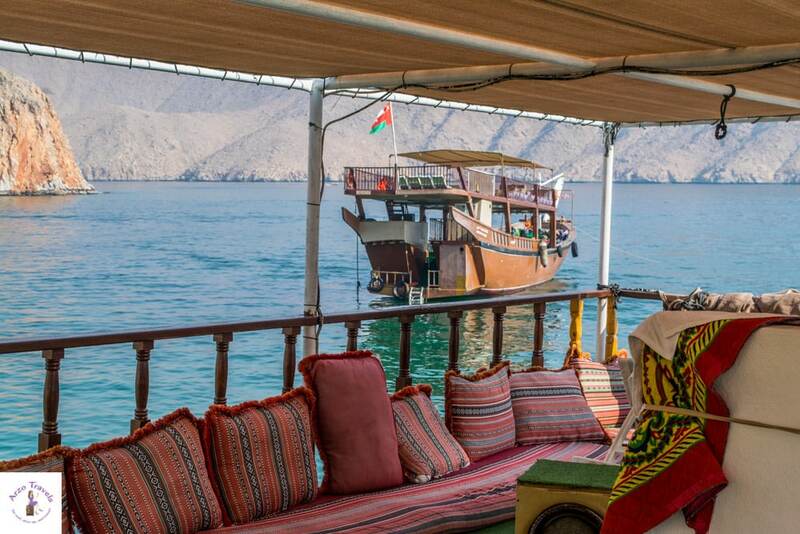 We did a Musandam dhow cruise from Khasab. The dhows are the original Arabic boats which are decorated with adorable Arabic cushions and rugs. Click here to find the tour we did. You can choose to sit on the top of the dhow or on the ground level and then you start your trip! Food and drink are often included, it does depend on the tour operator but I think most tour operators have similar offers. Ours included fresh fruit, water, juices, tea, and coffee all day long. Then for lunch, there was a small buffet and soft drinks served. To be honest it was nothing exciting and all quite simple but it was definitely enough for the day. 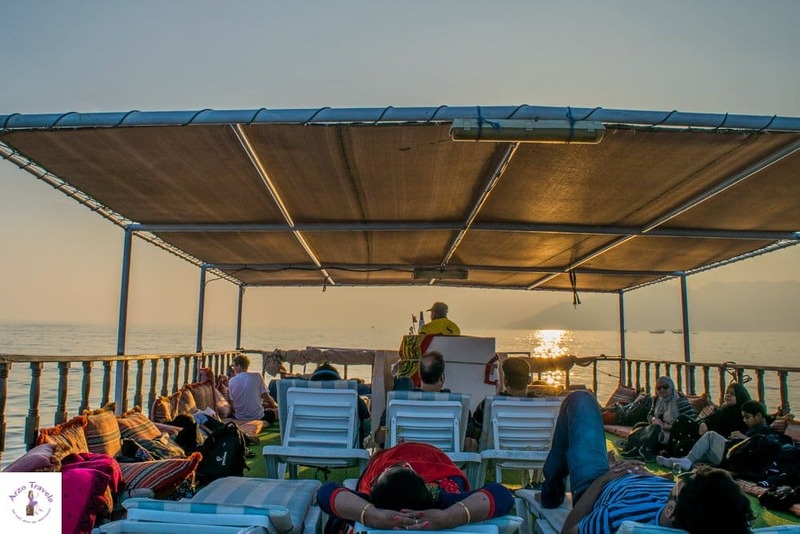 If you are looking for something completely tranquil then tours like this might not be the perfect choice for you as there is often music on the boat, which I personally enjoyed. When I went it was a mixture of international, Indian and US music. We sailed for about thirty minutes traveling past the mountains and what they call the fjords (although they aren’t officially fjords). Once at the beach we had the option to hop into the water or to take a small boat to get us right up to the beach. I really enjoyed my full day trip to Oman but to be honest, I was a little bit disappointed by the water. If you visit Oman to see the pristine clear water you see in the pictures sometimes, you will be disappointed. The water was not very clear, it was oily, and the area smelled like oil so bear this in mind before you go. We decided to take the smaller boat down and then only had to walk a few meters to get onto the beach. The beach, although nice, was a little bit dirty. Sadly, there was trash lying around where people had just thrown rubbish on the beach which of course is the fault of the tourists but it would have been better if there was a big rubbish bin. We had about an hour at the beach/boat and there were options to do banana boat riding (which was included in the price) or a speedboat trip which was really enjoyable, although it was a short ride of less than five minutes. 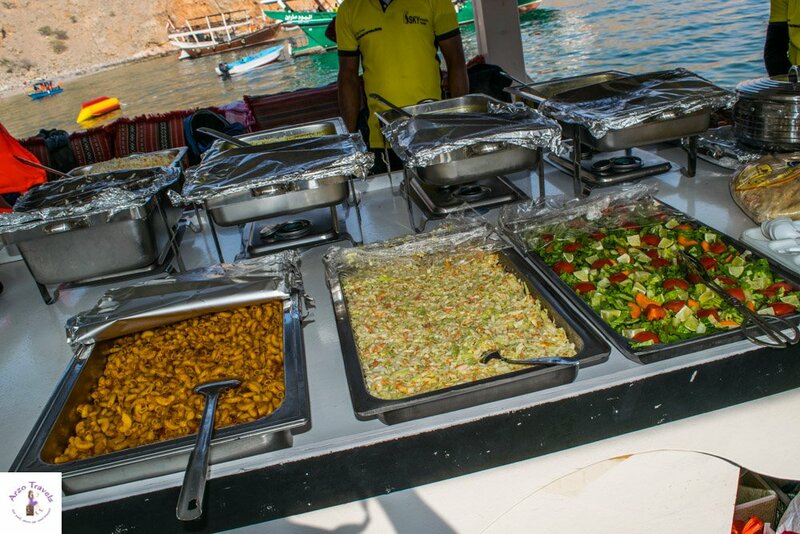 No trip would be perfect without food – and so these tours also include a buffet and more music and it was a really fun atmosphere with around thirty other people on the boat. The buffet simple, some rice, noodles, salads and a few more things (including meat) but okay for that day. In total we spent about five hours there and then we sailed back, again through the “fjords” – it was kind of really beautiful with the fog and the mountains and then we headed back to the border. However, I have to mention it again, the water was kind of disappointing! Just before that, some people had the chance to go fishing from the boat. As a vegetarian I skipped the chance: I didn’t even want to see how people do that, but it is an option there if you or any of your party enjoy that. Finally, we headed back to the bus and through the border which took another hour and after that we were heading back to Dubai. Is it worth to visit Musadam from Dubai? In total, the day trip took us about 14 hours, around six and a half of it on the bus which was a lot longer than I expected. 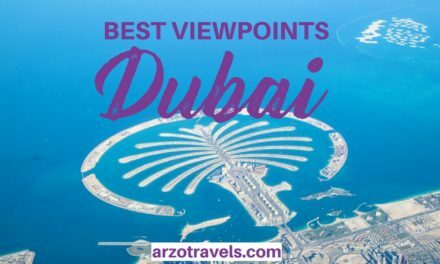 So, if you know that and you don’t expect the crystal clear perfect water of the pictures then a Dubai to Oman day trip is a perfect idea for getting out of the city for a little while. The prices are reasonable when you consider that there is food and drink included and you will not find anything like this in Dubai for that price. Have you added Oman to the list? Let us know! 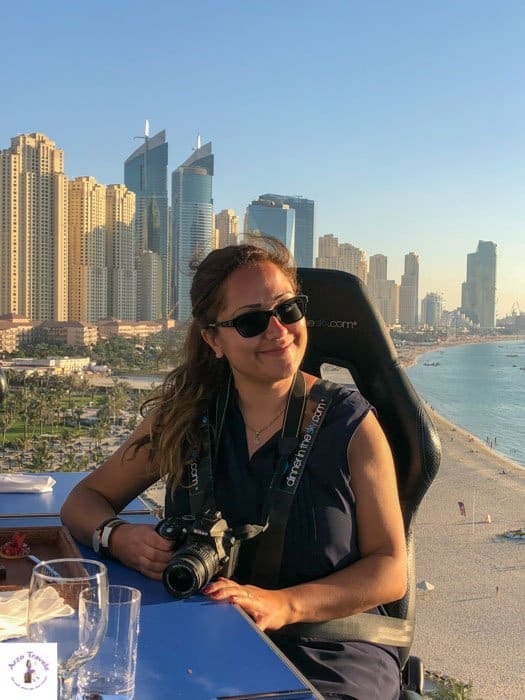 Click here to find all my posts on Dubai and Abu Dhabi!